One of the best parts about Hoboken is that it is so easy to get to and from New York City. 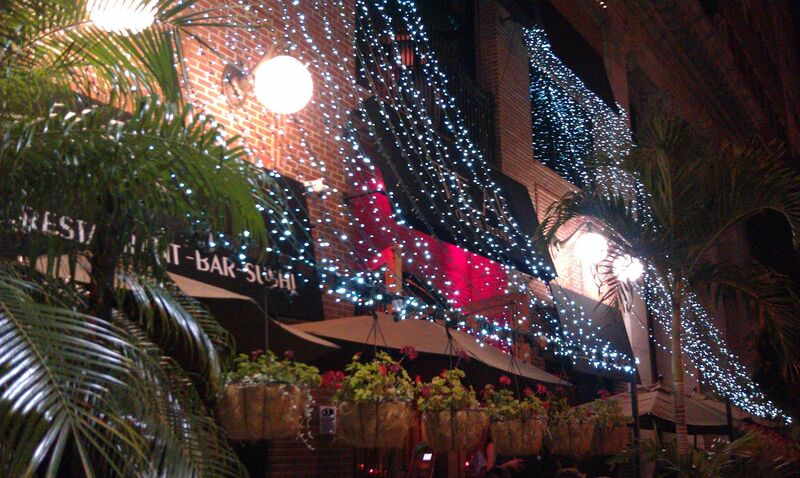 Because it is so close to Manhattan, some of Hoboken’s best places are distinctively not New York-ish. However in a city of 50,000 it’s important to still have a place that caters to everyone and recently a few places that give off that New York City vibe have opened up. One of these NYCish places is Teak On The Hudson, which brought Asian Fusion flavor and a Meatpacking atmosphere to Hudson Place, just east of River Street. 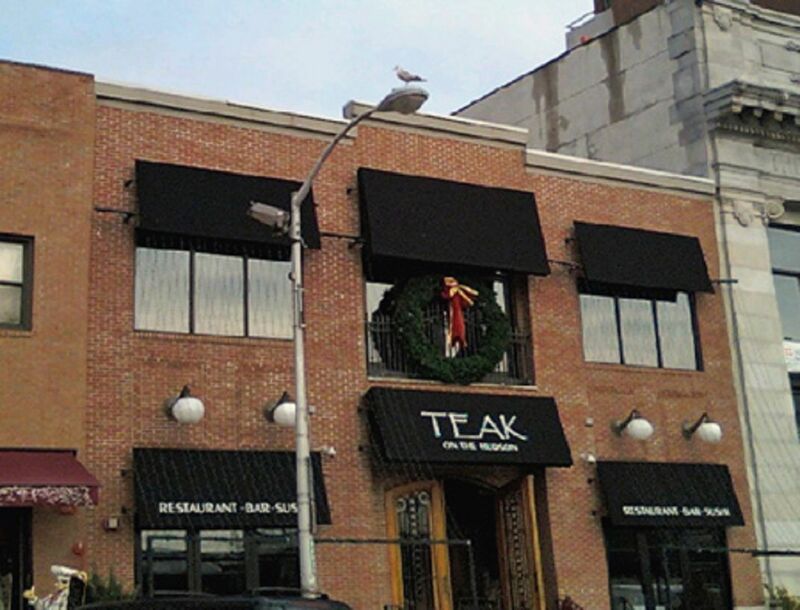 Teak On the Hudson opened in a beautifully rehabbed building just outside the PATH station. The classy brick building fits in with the historic surroundings and cobblestone streets. It has black awnings over all of the windows and a green tree/garden space separating the outdoor seating from the sidewalk. You can’t ask for a more convenient location if you are coming in or going out of Hoboken. With the PATH, Bus, Train and Ferry all less than a block away, this bar/restaurant certainly draws from a ton of different people but mainly the after work/visitor crowd. When you walk into Teak you can’t help but feel like you are in one of those big, posh Asian-fusion places in New York City, like a Tao or a Buddakan. 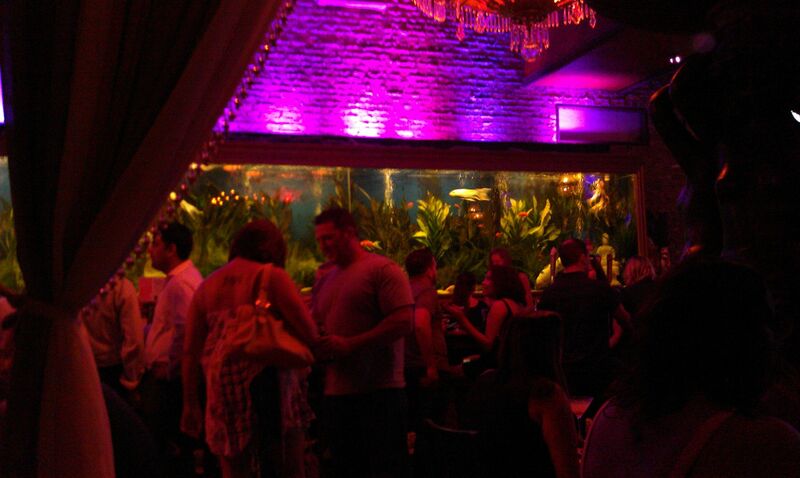 There is a huge fish tank all lit up separating the dining room from the bar area. Behind the bar area there are plenty of brightly lit HD TVs which were honestly clashing a little with the rest of the interior Asian motif. 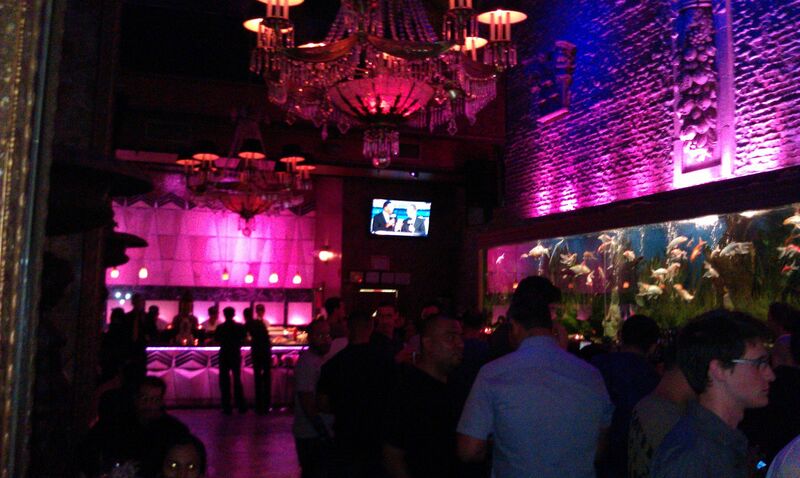 The interior is truly one of the nicest in Hoboken. 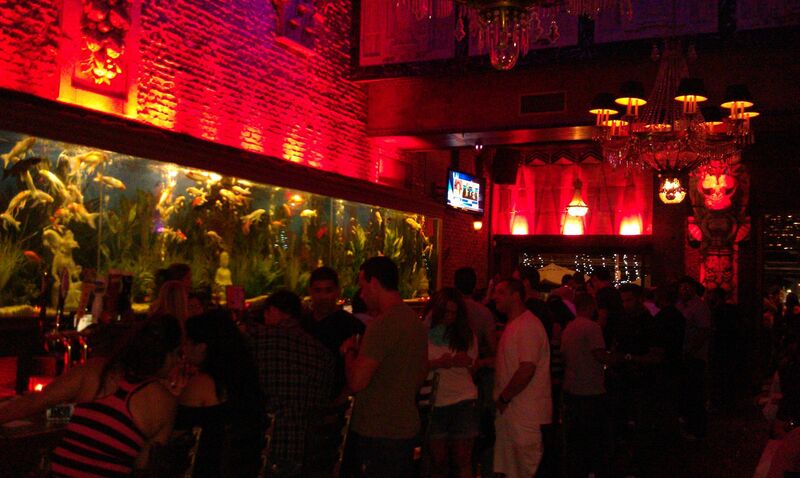 Between large chandeliers, fountains, and the aforementioned fish tank, it is clear that the owners really went all out in following through with their image for the bar. To the back of the restaurant there is a sushi bar, with what appeared to be some talented chefs carving up fresh fish. The seating area was dark but nearly all of the tables were packed and there is a staircase that leads upstairs, but I never have been up there before and didn’t get up there on this trip. One of the biggest draws to Teak is the fact that they have one of the best deals in town. Every Monday and Thursday, all drinks and nearly the entire menu is half off. With their normal outrageous prices for some of the meals/sushi/drinks I wonder why anyone goes to Teak when it’s not half priced. By that I mean it must be frustrating to go on a Wednesday night and pay double the price of what people on Thursday night are paying. Teak also treats its staff well by adding gratuity to the bill automatically and on the full price of the food/drinks, which honestly is the fairest way. I know bartenders get really pissed when people tip on the “special” price of food/drinks. Being that it was a Thursday night, my group ended up taking full advantage of the half priced drinks. There were glasses of wine and a bunch of drinks ordered off of the specialty drink menu. I went with the Spiked Palmer, which was basically an Arnold Palmer. For the ladies, or men comfortable having girly drinks, there was plenty of variations of fruity martinis, cosmos with Teak’s little twist, and even a Pink Lemonade that I came close to ordering before I realized that drinking a pink drink with a straw may be slightly embarrassing. The drinks are pretty costly if you don’t come on a half priced night so be sure to pack a couple extra 20s. 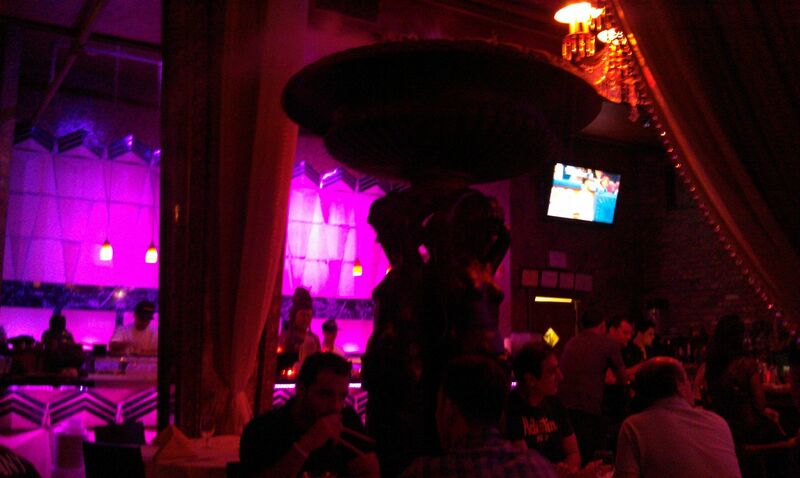 We were there for dinner, but as the night wore on the inside of the bar seemed to get a little clubby. The inside got even darker with the pink, florescent green, and redish-orange lights adding to the feel that the night was about to get more lively. As we walked out for the night, the music was building and as you turned back on the outside of the building, bluish white lights cascaded down the façade giving you the feeling of a destination. Preconceived notion – I’ve been there before for their delicious food, but always on a Monday or Thursday. I tend to not like Hoboken places that try to be too much like Manhattan because I think it loses the neighborhood charm, but there should be some place for everyone. Crowd stereotype – Lots of groups eating dinner, and seemed like there was a lot of people ready for a night out on the town. 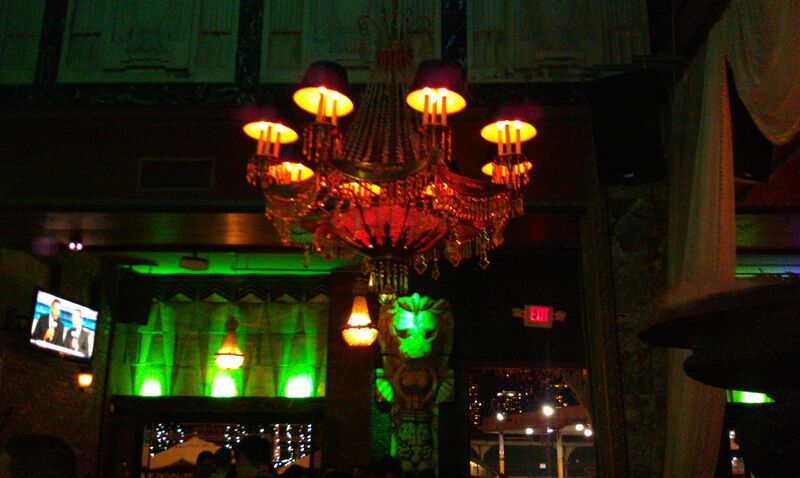 Music – Loud, as the night wore on- ended up being clubby. Value – They have happy hour specials until 7 nearly every weekday, but the best value is the half priced nearly everything on Mondays and Thursdays. Date – Definitely a good place for a date as it is truly an impressive place. However if you go on one of the half priced days it does send a little awkward message. I mean it’s really worth it and it drops the prices into the reasonable range, but do you want one of your first dates to be at a place that you specifically are going to for the discount? Tough call. Hookup – As the night goes on, I’d bet that there is a decent chance. Plus there are people from all over NY and NJ there so it’s not like you are going to have to run into the person again. Dance – Not while we were there, but on Fridays and Saturdays they advertise a DJ, so my guess is yes. Catch up with a friend – Little loud for that. First or last drink of the night – It’s so close to basically every form of transportation so it’s a pretty good location to meet up for a first drink. Overall – I have always been mixed on this place. I think the prices and location make it a place that is clearly looking to take advantage of out-of-towners that want to go to the flashiest and closest bar they can get into when they pile off the PATH, bus, train, or ferry. 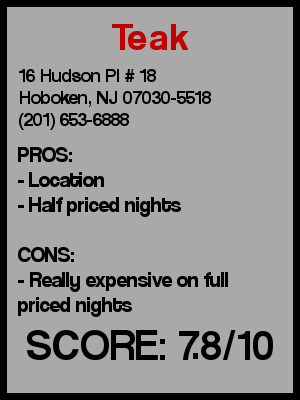 But then again they offer one of the best deals in Hoboken not just on Monday (traditionally a dead night), but also Thursday, which is generally a really busy night in Hoboken (especially during the summer). It is really an impressive space that the owners did a great job with. I’ll give it a 7.8. Hi! I could have sworn I’ve been to this web site prior to but right after searching by way of many of the publish I recognized it is new to me. Anyways, I’m undoubtedly pleased I discovered it and I’ll be book-marking and checking back again often!